Ballymena United and Glenavon fought out a six goal thriller at the Showgrounds on Wednesday night with the game ending in a 3-3 draw. United had taken a 3-0 lead through two goals from Kyle Owens and one from Cathair Friel - before the Lurgan Blues cane back through srtikes from Guy Bates, Greg Moorehouse and Ciaran Martyn. United wil have thought they should have got more from the game - but Glenavon proved their worth in the second halfBallymena had the first real chance of the game in the eighth minute but Allan Jenkins strike was tipped past by Jonathan Tuffey in the Glenavon goal. Tuffey was called into action shortly afterwards to turn away a Johnny McMurray header from a Tony Kane free-kick. The home side took the lead in the 13th minute. Tony Kane whipped in a corner and Kyle Owens powered home a header. The Sky Blues then had a penalty appeal turned down in the 38th minute as McMurray was sent tumbling by keeper Tuffey. But from the resulting corner it was 2-0 to United as Kane’s delivery found Owens again and he headed home. 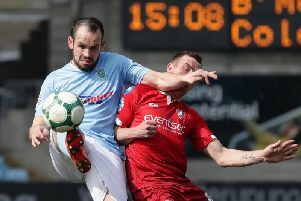 United were a completel different side to the one that lost 6-0 to Crusaders on Saturday and they made it 3-0 in the 53rd minute through Cathair Friel. The striker turning a Glenavon defender before calming firing past keeper Tuffey. Three minutes later it was 3-1 after Guy Bates scored from the penalty spot after a Glenavon player was fouled in the box. In the 69th minute it was 3-2. A beautiful ball in from the right was headed home by Greg Moorehouse. Game on. It should have been 3-3 two minutes later but Ballymena keeper Ross Glendinning did well to deny a clean through Bates. The Lurgan Blues did draw level in the 74th minute. Substitute Gary Hamilton’s shot fell to Ciaran Martyn and he fired hone to bring his side level. With 11 minutes left Ballymena’s Kane tried his luck from long range but Tuffey made a great save to deny him. Ballymena United: Glendinning, Kane, Owens, Flynn, Thompson, Jenkins, Friel, Wallace, Ervin, Millar, McMurray. Subs: Blayney, Henderson, McCloskey, E. Kane, Johnston. Glenavon: Tuffey, Lindsay, Kilmartin, Marshall, Cooper, Hall, Patton, Sykes, Moorehouse, Elebert, Bates. Subs: Hamilton, Doyle, McGrory, Martyn, Burns.